How behind I am on sharing postcards from the road! It's been a full few days, and internet has been spotty. But we're still at it, working our way slowly around the island. For the past week or so we've been moving to a new destination every two days. While at the beginning of our journey we sometimes moved day after day, we found that consecutive driving days meant we did little else, and had few opportunities to explore the landscape and community we were passing through. Since hitting this new 2-day groove we're all feeling more satisfied in what we've been able to see and do, as well as the balance of travel time, sightseeing, and downtime. 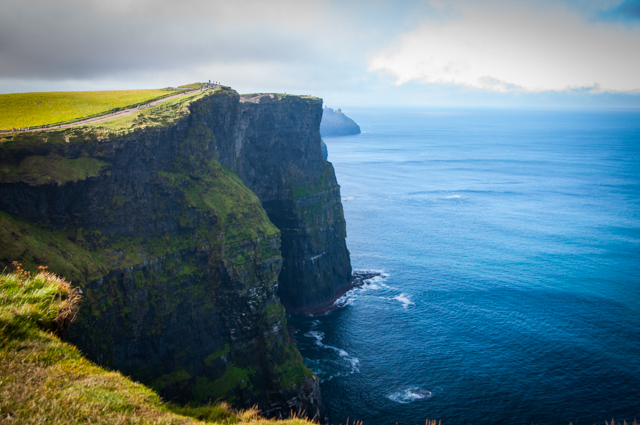 A recent two day layover was in western Ireland near the Cliffs of Moher. We took plenty of detours on the way to see historic sites, shrines, and surfing, but still made it to this can't miss destination. Thanks to a great tip from our B&B host that tipped us off to a "side door" into the Cliffs of Moher, we managed to miss most of the crowds and save a few euros, all while taking in the best views. And what views they were! While there were a few other groups of hikers out on the uneven trails (most notably two groups of octogenarians who were far more fit that I), we had it largely to ourselves, a treat after the busy days before. Finally, after these two full days of fresh air and sightseeing, the kids requested a day or two of down-time. A couple of days devoted to books and art and tea. This plan sounded great to us all. We rearranged our plans for the next two days and there was knitting, reading, and drawing to attend to. And – thanks to a well equipped B&B – Pete even taught the kids to play pool. Of course being in Ireland, we also drank an unreasonable amount of tea (with biscuits, of course) all day long. It's all about balance, after all. Have you heard the song Ireland by Garth Brooks? Because I feel like belting that song out with every single one of the pictures you share. And even if you’re not a country music fan you really should go give that song a listen. I havent but Ill find it and have a listen! Thanks for the tip!